Little did we know, but when Traveller’s Tales first emerged with Lego Star Wars (LSW) in 2005, they would have on their hands not only one of the sleeper hits of the year, but the beginnings of a gaming craze. Even without rewriting the platformer rule book, the game garnered a lot of admiration for its fun, humorous homages to the silver-screen classics, whilst achieving that oh-so-difficult task of entertaining players of all ages. Though the Lego circus had begun to sprout games thick and fast by late 2009, it didn’t trouble Lego Batman: The Videogame, which turned out to be an absolute corker. Beneath a familiarly accessible (reusing the LSW game engine), light-hearted veneer beats the heart of a truly complete 3D platformer, sporting a whopping 30 levels, a chasmic selection of collectibles and superlative structuring that perfectly tailors the experience towards maximising the extensive replay value within. Its gameplay is an archetypical evolution; not reinventing the wheel, but recognising little alterations that needed to be made to keep players engaged. Whilst it was easy to appreciate the myriad of characters in LSW, differences were mostly cosmetic, rarely extending beyond the ability to double-jump or use lightsabers. 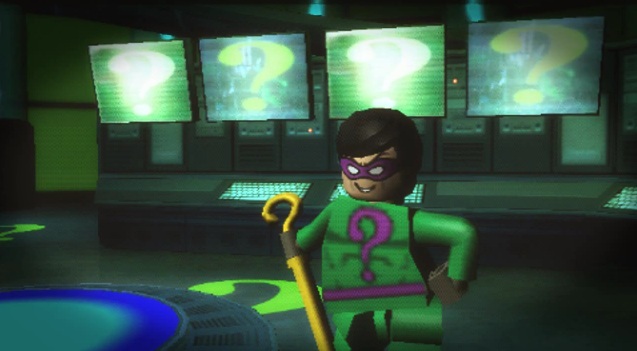 Traveller’s Tales have built all of the ‘goodies’ missions in Lego Batman around suits; both Batman and Robin can don outfits that grant the ability to withstand extreme heat, glide, travel underwater and use demolition charges. There’s even a suit that allows Robin to traverse walls in magnetic boots. Since the dawn of time, mankind’s favourite past-times have been to build, and to destroy. Between conflicts, we’ve also learned that it’s especially fun to do both with bright plastic bricks. Lego Batman is thus the thinking-man’s war game. Not really; it’s a family-friendly 3D platformer. But brick-smashing remains a key facet in how the game operates; not only does busting up scenery earn you ‘studs’ (the game’s currency) but in many instances leaves pieces of Lego bouncing around, ready to be used to create new and useful objects. These can range from switches, ropes and platforms to aid your progression through the levels, to vehicles you can motor around on, as well as turrets and electrical charges required to defeat bosses. You’ll need a keen eye; sometimes it’s simply a case of locating a couple of small bricks needed to form that crucial rung in a ladder, but the player is often challenged to look further afield for a solution, as a Batarang can be aimed and chucked to take out certain foes or structures that are out of reach. It may have followed hot on the heels of Lego Indiana Jones, but make no mistake, there’s been a heck of a lot of work done in fleshing this out. Batman’s fifteen levels see him teaming up with Robin and travelling all over Gotham City in three mini-stories that chart his feuds with the Penguin, Riddler and Joker, and barring the odd flying and driving level designed to add some action emphasis, most will last at least half an hour, packing a gargantuan amount of smash ‘n’ build fun as well as hidden goodies and puzzles. As if this wasn’t enough, there are fifteen more stages from the villains perspectives, using Arkham Asylum, rather than the Batcave, as a hub of operations. And if anything, these are even more fun. They work cleverly as a flipside to Batman’s stories, so whilst the opening level ‘You Can Bank On Batman’ sees the caped-crusader rushing to the scene of a bank-robbery, it’s mirror-level ‘Riddler Makes A Withdrawal’ pits you as The Riddler and Clayface as they pull off the heist. The villain stages feature recognisable settings, but the environments themselves offer unique layouts, so there have been no shortcuts design-wise. Add to this the opportunity to play as a mammoth roster of famed underlings such as Mr Freeze; Harley Quinn; Catwoman and Killer Croc, and you’ve got a dreamy amount of fan service. The platforming itself still isn’t especially refined; climbing ladders is needlessly cumbersome, as is judging certain jumps and the one-button mash-athon combat, which though trouble-free, doesn’t make for the most edifying of experiences. But it doesn’t really matter; Lego Batman impresses because of how interactive it feels, and how many secrets it harbours, just out of sight. There’s so much to each level that really each of the thirty is deserving of a couple of hours play individually. 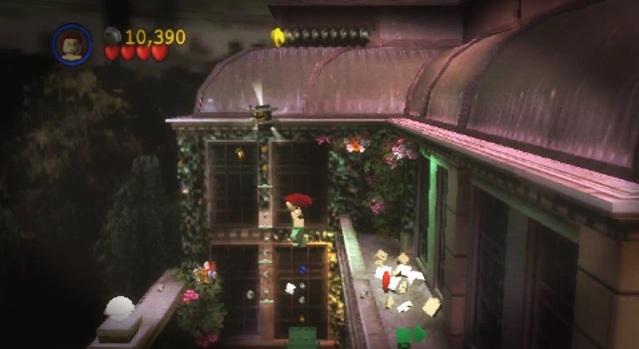 There are ten pieces forming a Lego model splashed around every level; a hostage needing to be rescued and a unique red brick to be found; whilst amassing enough studs to reach ‘super-hero’ or ‘super-villain’ status grants the player a piece towards a large model. Lego Batman instils in the player a wonderful belief that should you choose to hang around, experiment and delve a little deeper, there’ll be lots of rewards in store. Gotham City looks funky in brick form, capturing the streets and various landmarks effectively. 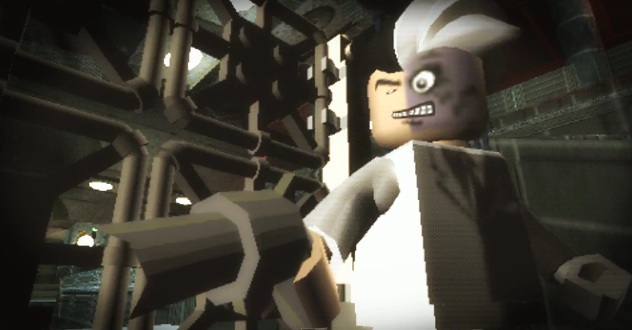 On the whole it’s as you’d expect from a Lego game; nothing visually extravagant though nevertheless easy-on-the-eye. Though the level of detail and general activity is very impressive, there is the odd moment here and where the picture appears compressed. Still, the instances when characters scuttle around at light-speed assembling a new construction from scattered bricks are endlessly satisfying. The simple cut-scenes outline a vague plot direction, with a well-judged dash of humour. Whilst there’s no dialogue and the sound effects are somewhat incidental, the soundtrack is more notable, as it uses Danny Elfman’s compositions from the 1989 Batman film, which is a nice touch. 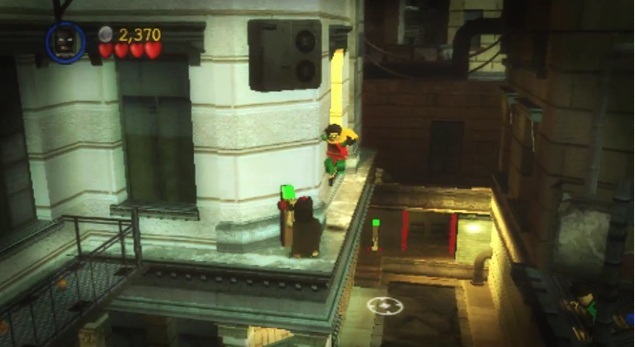 Lego Batman fares superbly well on the PSP, even if the portable version suffers from a couple of minor issues. The first is loading times; upon booting the game, there are a couple of really quite lengthy waits, so it’s best to make use of the console’s stand-by function where possible to avoid having to repeatedly sit through these. Strangely, for a game that is essentially cooperative in nature, it features no multiplayer options – not even a local, peer-to-peer setup that would have allowed for some classic drop-in/drop-out gameplay. It should be noted however that the computer-controlled ally is no slouch. They do make the odd slip-up, but you’re unlikely to find yourself screaming at the screen as they tend to do the right things during co-operative puzzle solving and can handle themselves in combat. It’s a real pleasure, when all’s said and done. The new suits and vehicles add a sprinkling of variety to an otherwise water-tight platform game, and whilst there’s still perhaps a slight clumsiness lingering over from the earlier Lego titles, Traveller’s Tales’ trek into Gotham City sees the positives significantly outweighing the negatives. Few recent platformers have had such depth invested in their level design, or offered such longevity and once again, it’s a game that those of all ages can enjoy. This is no holy abomination, that’s for sure.